Karen Gerardo is in her second year as a violin teacher with FACP at Peak Preparatory. She teaches the fourth grade class, and a combination class with sixth and seventh graders. 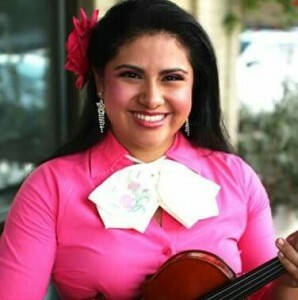 Outside of FACP, Ms. Gerardo regularly performs with Mariachi Rosas Divinas, an all-female mariachi group. A freelance musician, she is also principal master with the New Philharmonic Orchestra of Irving. And, she teaches the afterschool orchestra program at Paul L. Dunbar Elementary school in DISD. What is your violin background? I’m very much rooted in Dallas. I graduated from Booker T. Washington High School for the Performing and Visual Arts. I was also part of the Young Strings program [a Dallas Symphony Orchestra music education program] through my middle school and high school years. I began my mariachi career by joining Mariachi Rosas Divinas in 2006. I’m currently working on my bachelor’s degree in music. How old were you when you started playing violin? Do you play other instruments? I started playing violin when I was 6 years old in first grade. I play a little bit of viola and it’s been years since I have played piano. My piano skills are at a beginner level, so it’s more for fun. Who is your favorite composer to play? That’s extremely hard to answer! I love many composers for different reasons. It also depends on the genre of music and what mood I’m in. Right now my top three for classical music would be Tchaikovsky, Sibelius, and Shostakovich. What do you love about teaching young violin students? I love the excitement and satisfaction they get when they accomplish a skill or song that they had been working on. Have you taught other ages? Yes, I worked privately with middle school and high school students and directed the mariachi at BTWHSPVA. What is a particularly memorable recital or performance of yours? That’s also hard to pick! I have to pick the year were the mariachi performed with the Grammy award-winning band Ozomatli at the Palladium Ballroom for Red Bull Battle of the Bands. I had the honor to perform the guitar riff at the beginning of Van Halen’s “Hot for Teacher” with an electric violin. Let’s just say the crowd went wild! What piece of advice would you give 11-year-old Karen? At that time, I was involved with ballet and enjoyed it more than orchestra. So if I could go back in time I would tell myself to get exposed to as much music as possible and to take every opportunity to perform. And, have patience when things are tough! What’s your favorite sound (musical or non-musical)? Least favorite? A baby’s laughter just makes me smile every time! My least favorite sound is plastic utensils rubbing against each other. I know it’s weird, but it puts me on edge! Once you leave this world and reach the pearly gates, what celestial concert are you looking forward to? That’s so hard to answer! Let’s see… Christian Ferras playing the second movement of the Sibelius violin concerto, Humoresque by Alex de Taeye played by Itzhak Perlman, and the festive overture by Shostakovich to name a few.